When I left the University of Colorado, I worked on a political campaign, which was an awesome job, but it only paid $12 an hour. I knew I wouldn’t be able to pay off my $30,000 of student loans on that income. In fact, when I called my student loan servicer to find out about my options, the lowest payment they offered me was $250 a month, and that barely covered the interest! There was no way I could pay $250 a month, so instead, I decided to defer my loans — it felt like my only option. This meant I didn’t have to make monthly payments for a few years, but I also added thousands of dollars in interest to my loans over the course of my deferment. Once I started earning a better income, I began paying back my student loans faster. As this blog became more successful, it helped me pay off every penny of my student loans — all $30,000 of them. I’m now lucky enough to be loan-free! But my interest rate was absurdly high: 8%. I wish I’d known to refinance my student loans, because I could’ve saved a lot of money. So I was pretty psyched to hear about a new option for refinancing called CommonBond. I wish I had access to or knew about a program like this when I was right out of school! I hope it can help some of you avoid paying as much interest as I did. If you’re trying to pay back student loans right now, you should definitely look into refinancing options. Even if you don’t go with the option I’m suggesting, find out about refinancing — you can save a significant amount of money on interest over the course of your repayment period, and possibly even lower your payment. Especially when you’re a new grad, every penny counts! Refinancing basically means that you work with a company to get a whole new loan and interest rate. The company pays off your federal loans and then brings the loan over to itself, so you owe that company instead of the federal government or private company. This refinancing often gives you a lower rate and lower monthly payment, depending on the terms you agree on. One of the fastest-growing companies that helps students with loan refinancing is CommonBond. CommonBond’s founder, David Klein, found the student-loan process to be completely arduous and frustrating — who wouldn’t?! — when he was applying for loans to attend business school. So he, along with two of his business school classmates, co-founded CommonBond when they graduated. Their goals are simple: They want to make the student loan repayment process easier and treat their customers really, really well. Let’s take a look at how working with CommonBond would have helped me, back when I first started repaying my student loans. As I mentioned, I had $30,000 of student loan debt at 8% interest. The lowest monthly payment I could get was $250 a month, which was high enough to make me defer my student loans. As a result, I paid thousands of dollars in extra interest on those loans during the deferment period. Most undergraduate students who take out federal loans today will have an interest rate of 4.29% (a number that fluctuates from year to year), and most graduate students will have an interest rate of 5.84% or more. Interest rates for private student loans can be even higher than that. CommonBond says it can offer such low interest rates because it believes in its customers’ ability to pay back their loans. Because the founders of CommonBond were students themselves, they know students don’t want unreasonable interest rates. They just want to be able to borrow money for school and pay it back. Let’s use my debt as an example to see the potential savings. Say I made the minimum monthly payment over the entire course of my loan. I would have paid more than $30,200 in interest alone. Signing up with CommonBond would’ve helped me access fixed rates as low as 3.74% (or even lower variable rates). Instead of making those hypothetical minimum monthly payments for 20 years, I would’ve had a lower monthly payment, paid off my loans five years faster and saved almost $21,000 in interest. What? $21,000?! That’s an INSANE amount of money to throw out the window. While CommonBond used to be available just for students at select schools, the company has expanded to offer refinancing to undergraduate and graduate alumni of more than 2,000 schools. I’m all about getting your own personal finances in order. But when you can do that while also helping others who need it… that’s why this company really caught my eye. CommonBond expects to donate $200,000 this year to Pencils of Promise, which funds education and builds schools abroad for children. Pencils of Promise ensures all money donated online goes directly toward helping children in other countries go to school. Since its inception in 2009, Pencils of Promise has built 304 schools and helped educate more than 33,500 students, and CommonBond’s donation will help that number grow. If you want to free up money every month to use for other things like investing, travel or just finally building up an emergency fund, it might be worth considering refinancing your student loans with CommonBond. You could walk away with a lower monthly payment and pay off your loans faster, which means putting less of your hard-earned dollars toward interest. I wish I’d known about an option like this when I was struggling to pay off my student loan debt. But telling you about it is the next best thing! If you want to learn more about CommonBond or get a interest rate quote — it takes about five minutes — click here. And let us know how it works out for you! 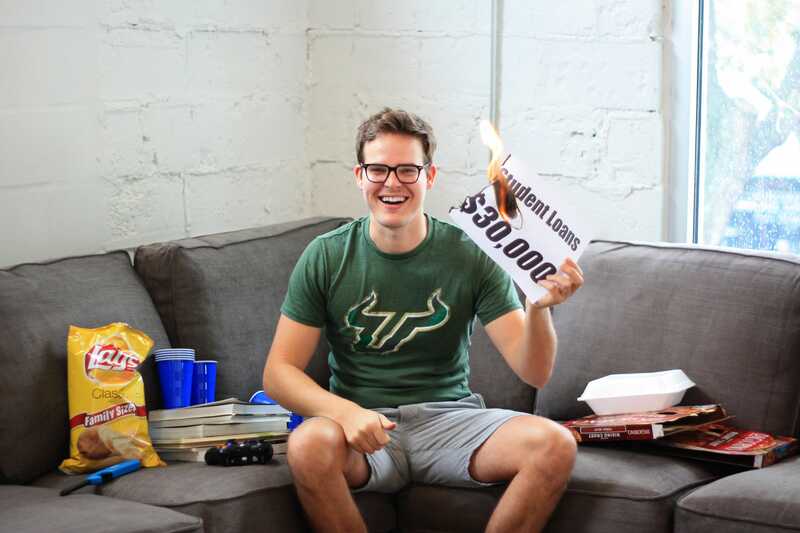 Your Turn: Have you refinanced your student loans, and how much did it save you? If you haven’t, would you consider trying it? Sponsorship Disclosure: A huge thanks to CommonBond for working with us to bring you this content. It’s rare that we have the opportunity to share something so awesome and get paid for it!